From the station, this walk follows the footpath towards the highway, passing the left side of the car park, until it reaches the highway, which it crosses at the traffic lights. The walk continues along Oliver Street for a while before coming to the intersection with Boundary Road. 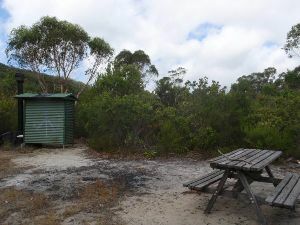 Here, this walk turns left, following the road for a short distance before taking the first right onto Freemans Road and continuing past the large scout camp, to the end of the road, where it comes to the intersection with the management trail at the corner of Bella Vista Street. Veer left: From the intersection, this walk follows the management trail, crossing under the high tension power lines and bending around to the right a short distance, before coming back around to the left and passing a management trail (which heads behind some houses). The walk continues down the hill, passing another trail on the left as the hill steepens and comes to an intersection with a rough bush track, opposite the power line tower at the bottom of the trail. 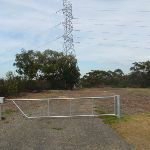 Turn right: From the intersection, the walk follows the bush track on the opposite side of the management trail to the power line tower. The walk passes a burnt-out car shell before turning down the long steep hill and winding down to the ‘T’ intersection with a wider track. 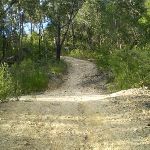 Turn right: From the intersection, the walk follows the track heading down along the side of the hill and through the thick bush. 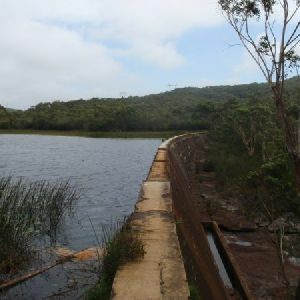 After a short while, the track comes to a large concrete pipeline, crossing it at the metal platform to the intersection with the management trail. Continue straight: From the intersection, this walk follows the ‘Mirang Pool’ arrow along the asphalt trail down the long hill. After a short while, the trail bends around to the left, turning back towards the pipeline, and continues downhill until it flattens out and crosses a bridge at the pipeline. 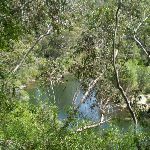 From here, the walk continues along the management trail, following the pipeline (with Heathcote Creek down the hill on the right) for a while before coming to the signposted intersection with the Mirang Pool track. 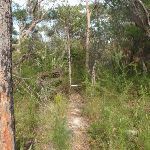 Continue straight: From the intersection, this walk follows the ‘Lake Eckersley’ arrow along the management trail, keeping the pipe line to the left, as it heads through the bush. 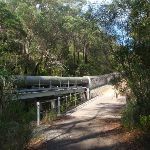 After a while, the trail does a large ‘S’ bend, crossing the pipeline twice as before passing through a gate and up to the intersection with the Mirang Road service trail. 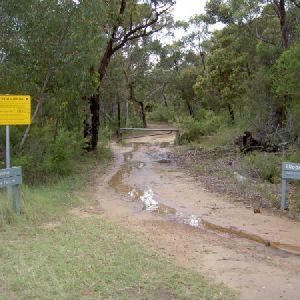 Continue straight: From the intersection, the walk follows the asphalt management trail, keeping Heathcote Creek and the valley to the right as the trail rounds a bend and heads up run parallel with the pipeline as the trail becomes gravel. 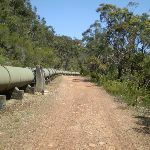 From here, the walk continues along the management trail, keeping the pipeline on the left for about 750m. 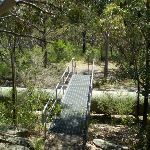 The walk then crosses over the pipeline using a timber bridge and 160m further along the management trail the walk passes a picnic table and crosses Heathcote Creek at the concrete Battery Causeway. 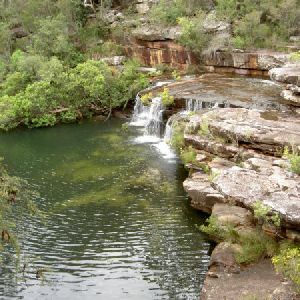 (Here you may notice the ‘Bullawarring Track – Waterfall 7km’ sign up to your left). 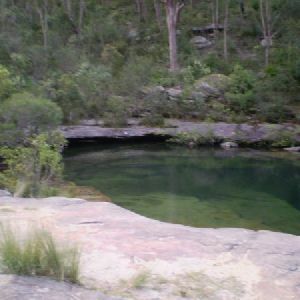 Veer left: From the intersection (on the western side of the causeway), this walk follows the somewhat over grown ‘Waterfall 7km’ arrow on the ‘Bullawarring Track’ signpost, along the narrow track that initially heads up the hill away from the creek then bends left, keeping the valley to your left. 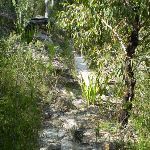 The walk then follows this narrow track south, keeping Heathcote Creek down the hill to your left, as the track climbs up the side of the hill to flatten out high above the creek. 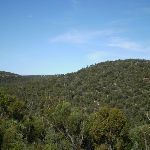 From here, the track continues along the side of the ridge, with occasional views of the creek in the valley to the left, as the walk winds through thick bushland until coming to the signposted intersection of the ‘Goanna Track'[ref img=114136. 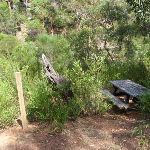 Continue straight: From the intersection, this walk follows the ‘Waterfall’ arrow on the Bullawarring Track signpost, winding along the bush track on the side of the hill for a long time, occasionally passing a rock platform with views of Heathcote Creek. 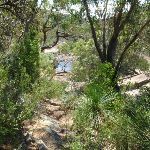 The walk winds up and down a few steep rocky sections and crosses the dried-up creek in Python Gully. 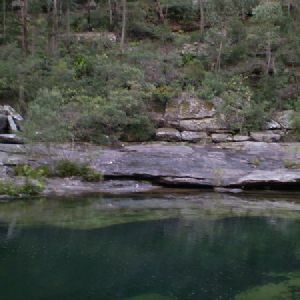 At this point, the track continues around the edge of the valley before descending quite steeply to Heathcote Creek, where it comes to the signposted intersection of the Mooray Track. 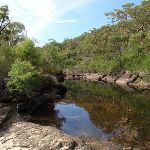 Continue straight: From the intersection, this walk follows the ‘Waterfall’ arrow on the Bullawarring Track signpost, heading along the bush track which follows Heathcote Creek. 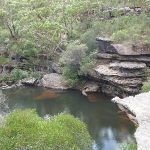 The track winds through the bush with small ups and downs, until it comes back down to the side of the creek, crossing at the rocks. 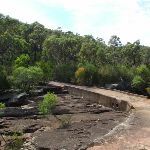 Continue straight: From the intersection, this walk follows the ‘Waterfall’ arrow on the ‘Mooray Track’ sign, heading down and across the creek at the rocks, following the painted track markers up the other side and along the bush track to a large open clearing. 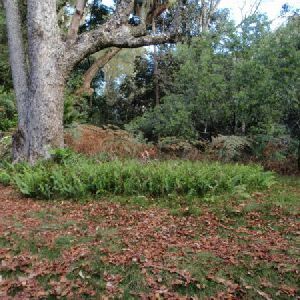 From here, the track follows the track marker though the clearing and along the bush track for a short while, coming to some large boulders. 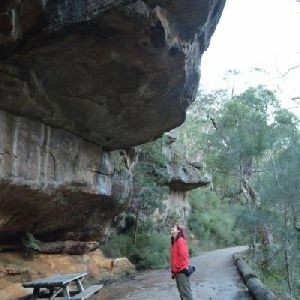 Here, the track turns right and then immediately left at the painted marker, climbing up onto the top of the rock platform. From the top of the platform, the walk follows the bush track, heading away from the creek for a short distance before turning left at the bush track and continuing to the Kingfisher Pool camping ground. 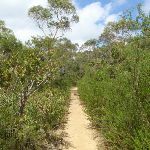 Continue straight: From the campsite, this walk heads away from the water for about 20m back to the main track, where this walk turns left to head east through the thick scrub for a while. 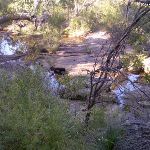 There is an occasional view of the creek as the track heads along to a ‘Y’ intersection with another bush track that has been blocked off. Here, this walk turns left and continues along to the signposted intersection with a management trail. 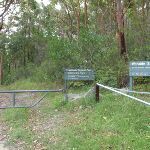 Turn left: From the intersection, this walk heads north, crossing the creek and heading along the service trail for a very short period, before coming to an intersection with a bush track going off to the right. 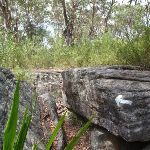 Turn right: From the intersection, this walk follows the ‘Bullawarring Track – Waterfall’ sign south-east away from the power lines, following the narrow but clear track for several hundred metres (ignoring faint tracks to the left). The track then lends slightly to the left and heads up the hill to an intersection with a service trail. Continue straight: From the intersection, this walk follows the narrow track and painted arrow in the middle of the rock step, heading east up the rocky steps. 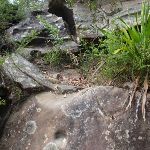 The walk climbs up some rough rock steps with some carved foot-holes in the rock outcrop, to the top of some short cliffs. 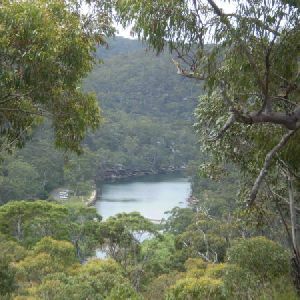 From here, the walk follows the rock platform at the top of the short cliffs, and the painted arrows, to the bush track which continues up the long rocky hill. The walk continues up a long set of wooden steps to the signposted intersection with a service trail. 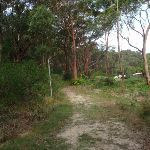 Turn right: From the intersection, this walk follows the service trail, heading up the gentle hill towards the houses for a short while before coming to the end of Warabin Street. 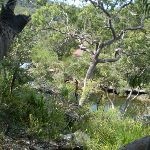 4.8km of this walk has gentle hills with occasional steps and another 3.6km has short steep hills. The remaining (1.6km) is flat with no steps. 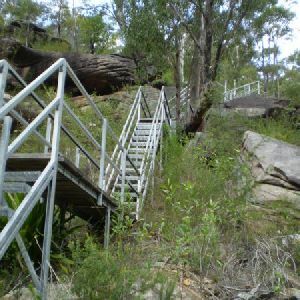 3.9km of this walk follows a clear and well formed track or trail and another 3.8km follows a formed track, with some branches and other obstacles. 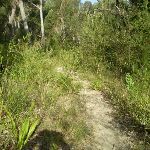 Whilst another 1.3km follows a rough track, where fallen trees and other obstacles are likely and the remaining 1km follows a smooth and hardened path. 5km of this walk is clearly signposted and another 3.6km has directional signs at most intersection. The remaining (1.3km) has minimal directional signs. 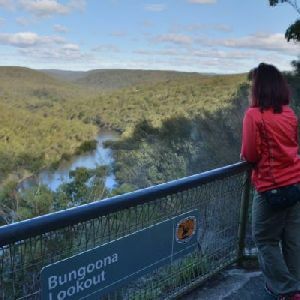 Around 5km of this walk requires some bushwalking experience, whilst the remaining 4.7km requires no previous bushwalking experience. 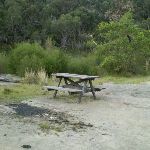 Around 9km of this walk has limited facilities (such as not all cliffs fenced), whilst the remaining 1.5km is close to useful facilities (such as fenced cliffs and seats). 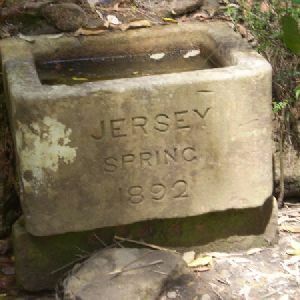 A list of walks that share part of the track with the Heathcote to Waterfall walk. 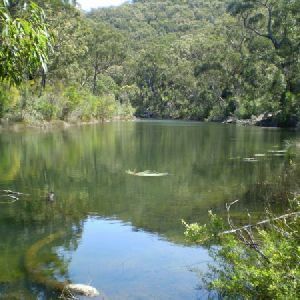 A list of walks that start near the Heathcote to Waterfall walk. 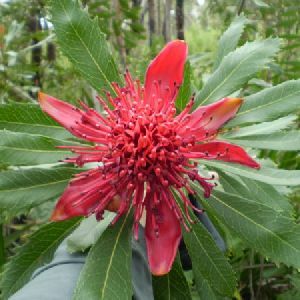 http://new.wildwalks.com/wildwalks_custom/includes/walk_fire_danger.php?walkid=nsw-hnp-htw Each park may have its own fire ban, this rating is only valid for today and is based on information from the RFS Please check the RFS Website for more information.